and turn upon its center. circuit" using a serial link with a PC. using a Mosfet under software control. between avoidance routines. A PIR  motion sensor is used to detect people or hot objects. Four "AA" alkaline rechargeable cells provide power for about 2 hours before recharging. out of dangerous situations. A switch is used to cycle the robot through different behaviors. Rollie's primary mission is to move forward and avoid obstacles, find people and move toward them. 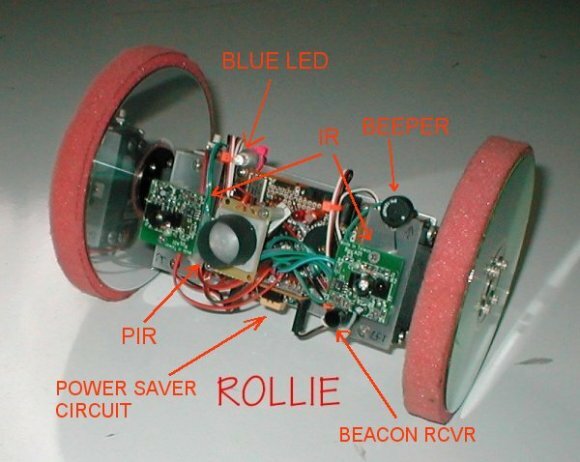 Rollie cannot find obstacles, people or the IR beacon, the robot will power down to "watch dog mode"